The classic Snickerdoodles cookies recipe is easy to make and is perfect for the holiday season. These cookies have a famous crunchy outside texture and soft and moist inside. If you would ask me about my favorite childhood cookies, I would definitely tell you; Snickerdoodles! I don’t know if I liked the name more or that mouthwatering cinnamon-sugary-buttery flavor. They were always a perfect treat for me. If you then ask, “What are Snickerdoodles?”, you would discover that they are perfect holiday cookies for Christmas. Here you can find links to my other delicious and popular cookies: Andes Mint Cookies, Raspberry Almond Thumbprint Cookies, and Oatmeal Cookies with Cranberries and White Chocolate. Before making these famous cookies, I wanted to understand the origins of this catchy cookie name. Apparently, the history of these cookies is still a mystery. Some historians claim that they originate from a Dutch or a German word, which means snail-like shape. Others say it originated in New England and it is just a nonsense word with no particular meaning. Even if it has no meaning, it is definitely unique and children love it! 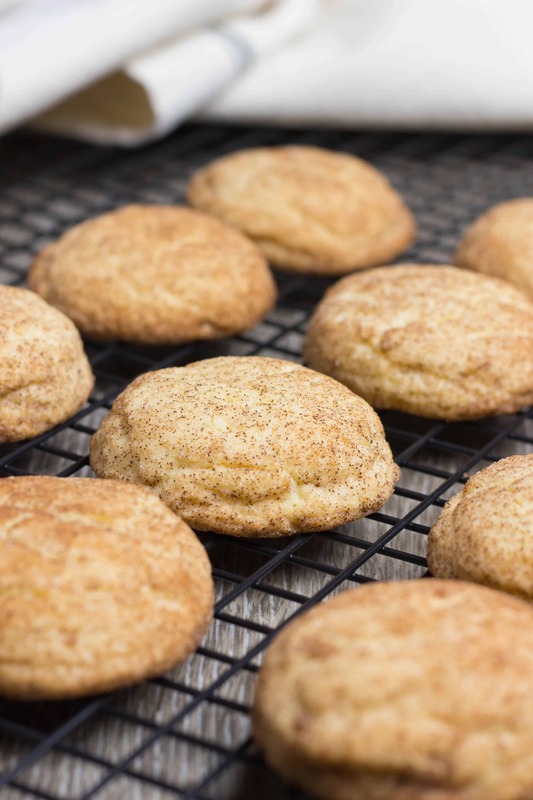 Classic Snickerdoodles are made with butter, sugar, eggs, and flour and rolled in cinnamon/sugar mixture. That additional step of covering the cookies with a mix of sugar and cinnamon gives a perfect crunchy outside texture, while keeping them soft and moist inside. The recipe for homemade Snickerdoodles Cookies is really simple. All you need is to mix all the ingredients, refrigerate the batter, roll the dough balls, cover them in cinnamon/sugar mixture and bake. You can keep baked cookies for up to a week in an air tight container. I can bet you, they will all be eaten within the first two days. “Snickerdoodles with Cream of Tartar” or “Snickerdoodles without Cream of Tartar”. Many people ask if it is necessary to use Cream of Tartar in Snickerdoodles recipe, or if this ingredient can be substituted. Both answers will be, yes. Here is a brief explanation of how Cream of Tartar works and how you can either use or replace it with other ingredients. If you already read my post about “Baking Soda vs. Baking Powder”, you probably remember that baking soda is a base ingredient that requires some acid to activate. Cream of Tartar is that acid that helps baking soda to activate. Together they create carbon dioxide, which allows your cookies to rise. 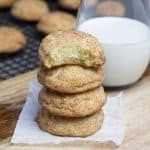 Because we don’t use any other acid ingredients to activate baking soda in this recipe (like lemon juice, vinegar, yogurt, sour cream), Cream of Tartar does a great job to help to make your Snickerdoodles soft and fluffy. However, if you don’t have this ingredient in your pantry, you can easily substitute it with adding some lemon juice. The proportion should be 2:1 (2 teaspoons of lemon juice per 1 teaspoon of baking soda). In this recipe, we are using ½ teaspoon of baking soda. So, if you don’t have Cream of Tartar, you can add 1 teaspoon of lemon juice. The final results will be quite similar. 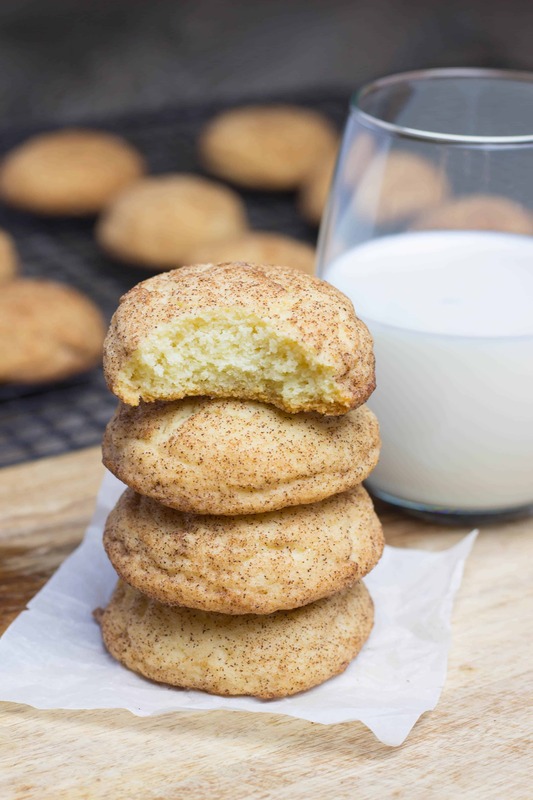 The classic Snickerdoodles recipe is made with butter, sugar, eggs, and flour and rolled in cinnamon sugar mix. These cookies have a famous crunchy outside texture and soft and moist inside. Preheat your oven to 350°F, line a baking sheet with parchment paper or a baking mat and set it aside. In a large mixing bowl, using a spatula, cream the butter and sugar together until smooth. Add an egg and vanilla extract and whisk it together until creamy and well combined. In a separate mixing bowl sift all-purpose flour, cream of tartar, baking soda, and salt. Add dry ingredients to the mixture and fold it in until well combined. Put the dough in the refrigerator for about 7-10 minutes. While the dough is in the fridge, mix granulated sugar and cinnamon in a bowl to make cinnamon sugar and set it aside. When the dough is ready, using a 1 ½ tablespoon size ice cream scoop or a regular tablespoon, scoop the dough into the balls and roll them around in the cinnamon-sugar mixture to coat. Put the cookies on a baking sheet and bake at 350°F for about 15-17 minutes. Cool the cookies on a baking sheet for 10 minutes, then remove the on a wire rack. Once made, what is the shelf life for snickerdoodles? I love snickerdoodles! We always put a cherry in the center. And as a kid, I would just eat the cherry part, hah. I need to make some as an adult! That looks like the prettiest and yummiest snickerdoodles to me!! These are my fave and love them with a cup of tea!! This is a classic that will never grow old. I really enjoy the taste of cinnamon and so does the rest of the family. Baking weather is here — yay! These cookies look so good and chewy! I gotta make a batch ASAP! Soft and chewy cookies are always a hit with me and my family. Making these for sure. Soft and chewy cookies are my favorite cookies. 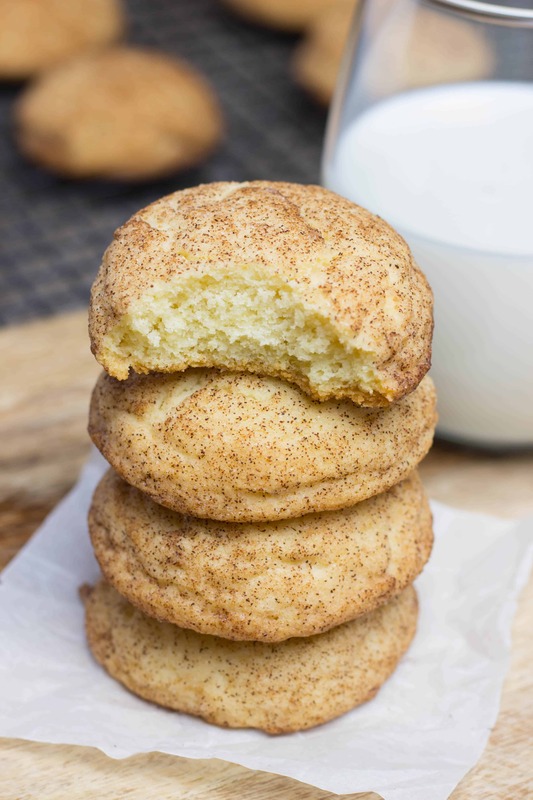 Snickerdoodles are one of those classic favorites, and I love the cinnamon and sugar combo. YEA! My kids are going to LOVE THESE! I love making fun treats to add to their lunches as an extra surprise 🙂 Great recipe!! I usually always make snickerdoodle cookies during Christmas holidays.. just like my mom use too. Loved when my mom made it. These look so perfect! I love snickerdoodles – they remind me of holidays and good times. The smell alone takes me back!